Coronation Street actress Connie Hyde says she has a “responsibility” to portray bipolar disorder properly. As potentially negative storylines surround Gina Seddon in coming weeks, Hyde has said she wants to protect her character from being seen as a “baddie”. Hyde has said that plotlines will draw Tim Metcalfe and Gina together, while Sally continues her struggle in the grip of the legal system. The actress said she wishes to make clear that her character is not made evil by her mental illness, as her behaviour becomes increasingly dictated by her bipolar disorder. She said: “I think I’ve got a responsibility of care. That’s why I thought it was very important to me she wasn’t seen as a baddie. Hyde has indicated there will be a big storyline for her character at Christmas, and expects a fan backlash. She joked that she will barricade herself in her house when the Christmas special episode airs on December 25. The character’s energy has presented the actress with challenges, but she says that a glass of wine helps her relax after inhabiting Gina. She added: “I found that hard at first, because a lot of scenes were hyper and that was exhausting. 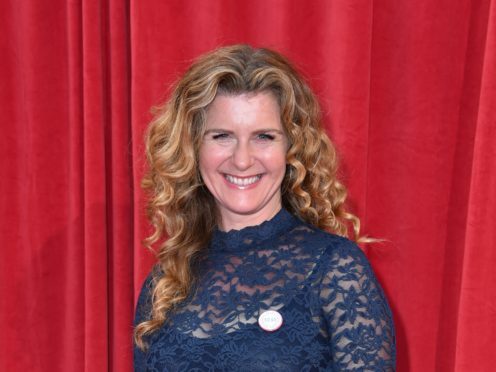 Hyde has said it is an “honour” to be involved in a big festive storyline.